Few know about the south area the University of Northern Iowa’s Wellness and Recreation Center (WRC), close to the landmark UNI-Dome. This area is home to UNI’s Athletic Training Program. This space is unique from other Athletic Training programs. The facilities athletes use are also where the students learn, have classes and clinical experiences. 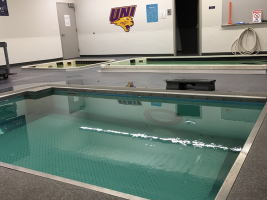 The aquatic therapy area boasts a Hydroworx underwater treadmill complete with underwater cameras so that a patient’s gait and walking patterns can be viewed and analyzed. Jets can be turned on to increase the resistance underwater as well. Other pools in the room include a cold plunge and hot plunge which are mainly used by athletes post workout. From the first day of entering the Athletic Training program, students are learning through hands-on experiences in the classroom, labs, and clinical assignments. This is completed under the supervision of faculty and preceptors. Preceptors are professionals who provide teach and evaluate students in the clinical setting using an actual patient base. 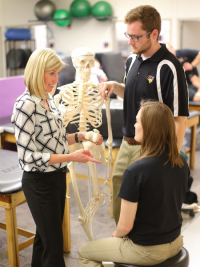 There are many opportunities within the Cedar Valley for students to gain experiences such as working with athletic trainers in various settings along with physical therapists, medical physicians, and occupational therapists. Throughout the program, students engage in patient care, figuring out diagnosis, and ultimately providing treatments. 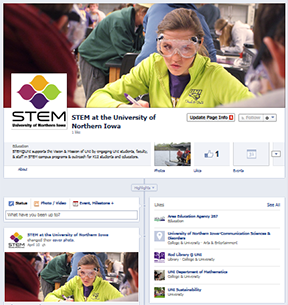 These opportunities and experiences set UNI apart from other programs. 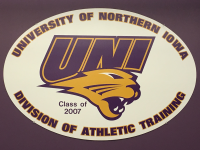 Payton Stock came to UNI as an Athletic Training student. He said, “UNI felt right. It’s not really something you can explain.” Cassandra Adamson and Eric Pimentel transferred into the Athletic Training program after a course peaked their interest and they were drawn to the hands-on training. “You really have to be motivated. You cannot just skirt by in your classes, it does not work like that. It will take a lot of your time,” Cassandra said. Courtney Kamman is getting her degree in Athletic Training with minors in Biology and Chemistry. She intends to attend medical school. 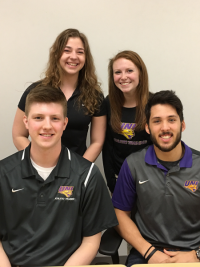 Each of these four students have their own driving force for to majoring in Athletic Training and each are passionate about it. Some were athletes themselves and all have an interest in helping others. The hands-on aspect of their education is the by far their favorite. The students’ favorite courses include Therapeutic Interventions, Clinical Integration, and Anatomy and Physiology. All the coursework helps develop a deeper understanding of the body and how it functions. The students agree that everything they learn in the classroom can be applied right away in their clinicals with patients and UNI athletes. This helps them get a feel for what they will be doing and how to connect with their future patients. Seeing the results in the outcomes for their clinical patients right away is rewarding. “Go where you love the campus and love the school. Where you go, you should love it, no matter what major you are or if the school has your specialty,” Cassandra said. The size of campus and classes, the sense of community and how everyone is so friendly were all characteristics that drew these students to call UNI home. The creating of a new family among fellow students and faculty has been the biggest surprise for the four students. These friendships are made in the classroom, in student activities, and during clinical training. Each student has his/her own experiences outside the classroom in their clinical assignments and undergraduate research. Payton works at a physical therapy clinic but makes time to go to $5 Movie Tuesdays with friends. Eric works at the Gallagher-Bluedorn, is a member of the UNI Men’s Rugby Team and is part of the campus organization International Student Promoters. This group is made up of primarily international students who promote UNI and lead campus tours. He has enjoyed making connections with people from all over the world and may have the opportunity visit a friend’s home country of El Salvador in the future. “To have this opportunity at UNI is phenomenal,” he said. Courtney works at the WRC, enjoys Hot Yoga and when she has time, loves to binge watch shows on Netflix. Eric, Payton and Courtney assist Dr. Mark Hecimovich on his research understanding concussions. Cassandra’s senior clinical assignment is with the Waterloo Black Hawks Hockey team. She said, “No skates are required but I have to walk very carefully on the ice.” She is studying for her board exams and works with Assistant Professor of Athletic Training Dr. Tricia Schrage and Dr. Kelli Snyder, Athletic Training & Program Director on their research on Manual Therapy Strain / Counter Strain. Like some of her students, Tricia transferred into UNI’s Athletic Training program after a fellow classmate mentioned it in chemistry class. Since then she has obtained all three of her degrees from UNI. She feels that she got a well rounded education from phenomenal instructors. Tricia worked as an athletic trainer in the before becoming the Clinical Education Coordinator here at UNI. While in this position she pursued a doctorate in education because it felt like it was the right fit. She is currently supervising research with undergraduate and graduate students, teaching classes and conducting her own research. 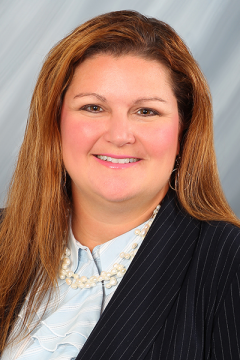 Tricia is interested in identifying meaningful patient outcomes and how to assess them. Courtney sums it all up, “Find your place. Find your people. Find what you love. I fell in love with Athletic Training. I love what I do. I love going to clinicals everyday. Being at UNI, you can choose what you want to do. Go where your heart takes you." For more information, please visit the Athletic Training Website to learn about the program, faculty and curriculum.